A 13th-century manuscript of Arthurian legend once owned by the Knights Templar is one of the star attractions of a new exhibition opening today at Cambridge University Library. The idea that post-classical Western literature really begins with the Renaissance is completely false. It begins right here, among the very manuscripts and fragments in this exhibition. An important manuscript of the Lancelot-Grail, it lay forgotten and unopened for five centuries until its rediscovery in North Yorkshire and its sale in 1944. Detailing the search for the Holy Grail, it goes on public display for the first time alongside the only existing fragment of an episode from the earliest-known version of the Tristan and Isolde legend. Also on display is an early example of the kind of guide familiar to thousands of today’s holiday-makers: a French phrasebook. A free exhibition, The Moving Word: French Medieval Manuscripts in Cambridge, looks at the enormous cultural and historic impact of the French language upon life in England, Europe, the Middle East and beyond at a time when French – like Latin before it and English today – was the global language of culture, commerce and politics. Burgwinkle, Professor of Medieval French and Occitan Literature at Cambridge, said: “French may have been brought to England by the Normans in 1066 but it was already here well before then as a language of knowledge and commerce. It served as the mother tongue of every English king for almost 400 years, from William the Conqueror to Richard II, and it was still in use as a language of royalty, politics and literature until the Tudor period, when we see Henry VIII writing love letters in French to Anne Boleyn. The early phrasebook, a guide to French conversation for travellers, is the Manières de language (1396). Composed in Bury St Edmunds and one of four in existence, it provides a series of dialogues for those travelling in France that inform readers how to trade with merchants, haggle over prices, secure an inn for the night, stop a child crying, speak endearingly to your lover or insult them. It also has instructions for singing the ‘most gracious and amorous’ love song in the world. Elsewhere, perhaps some of the most impressive exhibits on display are huge medieval manuscripts that acted as compendiums of knowledge. One such example is a multilingual encyclopaedia from the 1300s featuring more than fifty texts of historical, cosmographical, literary and devotional interest. 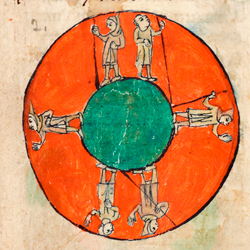 A heavily decorated volume, it is unusual for its thickness, and deals with, among other subjects, the roundness of the Earth and the force of gravity – centuries before Newton defined its laws. In contrast, the fragment of Thomas d’Angleterre’s Roman de Tristan (Tristan and Iseut) may appear small in comparison, but its size belies its importance to the Cambridge collections. Thomas’s Tristan romance is the oldest known surviving version of the tragic love story. His work formed the basis of Gottfried von Strassburg’s German Tristan romance of the 13th century, which in turn provided the chief source for Wagner’s famous opera Tristan und Isolde. The fragment on display, detailing King Marc’s discovery of his wife Iseut and nephew Tristan sleeping together in a wood, is the sole witness of this scene from Thomas’s text to survive into the present. 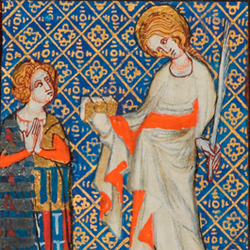 The Moving Word: French Medieval Manuscripts in Cambridge runs from January 22 to April 17, 2014, in the Milstein Exhibition Centre, Monday–Friday 09.00–18.00, Saturday 09.00–16.30 Sunday closed. Admission free. For further information, see https://exhibitions.lib.cam.ac.uk.